I had some ripe bananas and wanted to do something different with them. That is where the idea for these fritters came from. I was going to be making some doughnuts later that day, so I would already have hot oil ready for frying. Seemed like a great idea. I was quite pleased with how they turned out. Only a few ingredients, too. Simple to make and a nice change from banana bread. I started with a couple of bananas, which I peeled and mashed with a fork. I purposely left some small chunks of banana. Then I added eggs and sour cream. I knew the sour cream would add richness and help keep the fritters tender. 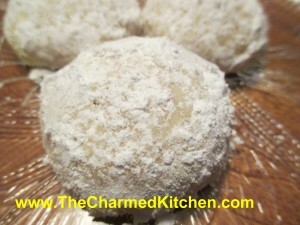 I also used cinnamon, both in the batter and in the powder sugar I rolled the finished fritters in. I like the combination of banana and cinnamon. 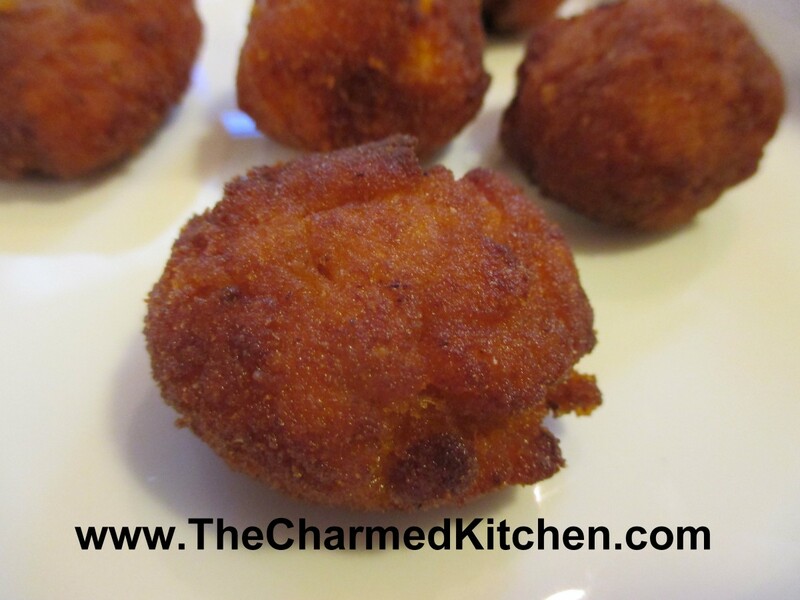 The fritters puffed up beautifully when fried. They were just a little crisp on the outside, tender and light in the middle. There is no sugar in the batter. The only sweetness comes from the bananas and the cinnamon powdered sugar I rolled them in. I think they would be great with a powdered sugar glaze, too. So here is the recipe. A fun way to use ripe bananas, for sure. Peel bananas. Mash bananas with a fork, leaving some smaller chunks. You should end up with about a cup of mashed bananas. Combine in a small bowl with the eggs, sour cream and cinnamon. Combine flour with the baking powder and baking soda and stir into the banana mixture. Heat oil in a pot to 350 degrees. Oil should be at least a couple of inches deep. By rounded tablespoonful drop batter into the hot oil to fry. Only do a few at a time, so you don’t overcrowd them, or bring the temperature of the oil down too much. Fry until golden brown. It will take several minutes. Remove with slotted spoon and drain on paper towels. Repeat with all the batter. You will end up with 2-3 dozen fritters. 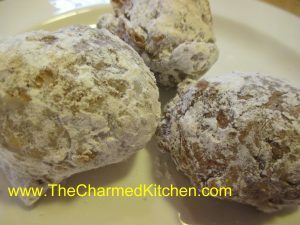 Once the fritters are cooled down you can roll them in powdered sugar, cinnamon sugar or even make a powdered sugar glaze. I combined cinnamon with a little powdered sugar and rolled the fritters in that. The cinnamon worked nicely with the bananas. I was defrosting my freezer and found local sweet corn I had frozen last summer. I had forgotten all about it. 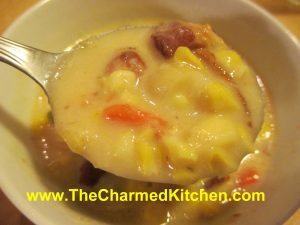 I wanted to make soup for a dinner with friends, so I decided to use the frozen corn to make this chowder. I also had a pound of bacon, which gave the soup a wonderful smoky flavor. I cooked the bacon in the soup pot, allowing it to get pretty crisp. I removed as much of the fat as I could, but left the bacon in the pot. Then, when I cooked the onions and added the stock, all the little brown bits of bacon in the pot added even more flavor. It was a big hit. A perfect dish for a snowy evening. I make homemade liqueurs throughout the year, using seasonal fruits. Fall and winter are best for citrus, so it is lemon liqueur time!!! All you need to get started is a jar, some vodka and lemons. Since you are using the peels, best to use organic lemons, if you can find them. Use a vegetable peeler to get just the yellow part of the lemon peel. A little of the white is OK, but too much will make your liqueur bitter. Combine the peels with the vodka in a jar with a tight-fitting lid. Now it’s just a waiting game. Once the peels have steeped long enough to flavor the vodka, just sweeten, if you like, and let the liqueur mature a little longer. Well worth the wait. You can use the same recipe to make lime liqueur, too. 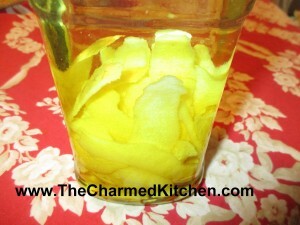 You can also use half lemon and half lime peels in the same batch for lemon/lime liqueur. You can also add other flavors, like mint, to your mixture. Peel lemons using a vegetable peeler. Use only the yellow part of the peel. 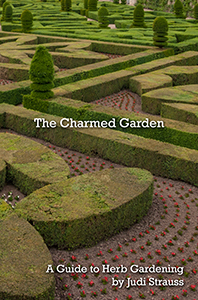 If you get larger pieces of the white pith, scrape off and discard. Place peels in jar with the vodka. Cover and place in a cupboard. Steep peels 2-3 weeks. Strain and filter and add sugar syrup. Mature 1-2 weeks. Note: you can also make lime liqueur with the peels of 8 limes, or use 4 lemons and 4 limes for a lemon-lime liqueur. Variation: You can also use rum as the base for a great daiquiri! Note: To make citrus flavors without the peels substitute 2 t. pure extracts for the fruit and add sugar syrup right away. Just steep a few days to mature a little. Also, lemon or lime are terrific unsweetened, to add to other cocktails. You can make some without the added simple syrup. Some cookies are really about the memories for me. I remember making pressed cookies when I was a kid. I loved using the machine to press out dough in all sorts of magical shapes. My mother was so kind- she let me make whatever I wanted. We had one Christmas with a whole plateful of camels. The machine we had required turning a handle- watching carefully, and turning the handle backwards to stop the flow of the dough. There are much easier versions of cookie presses today. Mine has a ratchet which pushes out the right amount of dough with one click. I decided to make some little green trees and red flowers this year. These cookies are light and very crisp. Great for having with coffee. They are also fast to make, once you get used to the cookie press. The fun thing about using a cookie press is that you can crank out a high volume of pretty cookies in no time flat. They taste good, too. I used vanilla extract in the little trees. In the flowers, I added some sweet cherry flavor, which paired well with the vanilla. In mixing bowl beat together butter and sugar until fluffy. Beat in egg. Stir in vanilla and salt. Tint dough, is desired. Add flour and stir until smooth. 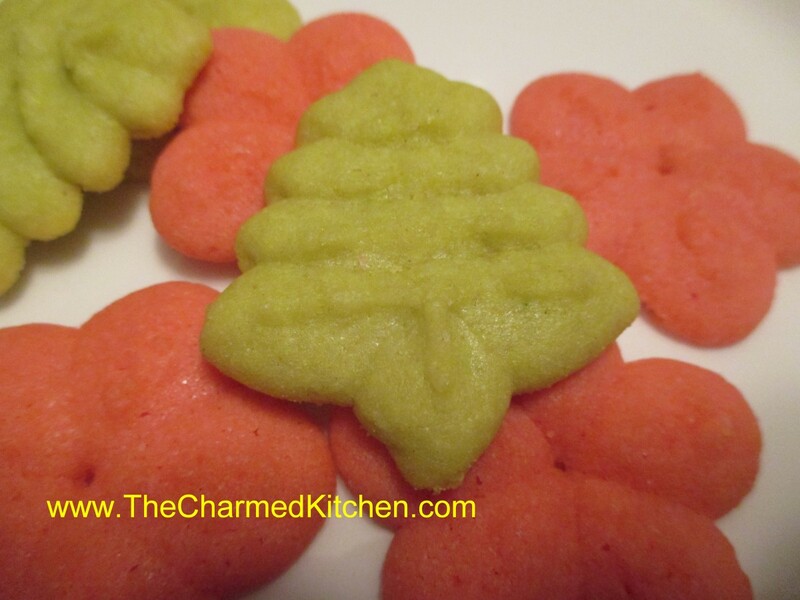 Using a cookie press with desired shape press cookies on to ungreased baking sheet. Leave about 1-inch between cookies. Bake in a preheated 375-degree oven for about 10 minutes- cookies should be a light golden color around the edges. Cool on a wire rack. Makes about 3 dozen. * You can play around with other flavors. I often add mintextract or a fruit flavor to these cookies. I love the sweetness of dates, and really enjoy using that natural sweetness in baking. I always seem to make several dishes with dates around the holidays. 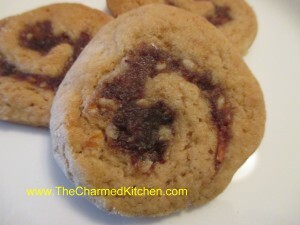 These date filled cookies are one of my favorites. Moist and cake-like, with the wonderful flavor of the dates, nuts and citrus zest, these cookies taste even better than they look. The cookie dough, made with brown sugar, has an almost caramel-like flavor. The combination is a winner for sure. Combine dates with all ingredients (except the nuts) in a small saucepan. Cook, stirring constantly, until thickened, about 5-10 minutes. Stir in nuts. Cool. In bowl combine butter and sugar and beat until fluffy. Add egg and vanilla and beat well. Combine dry ingredients and stir into butter mixture. Divide dough in half. Roll or pat one half of the dough into a rectangle about 7×11- inches in size. Spread with half of the cooled date filling. Starting at long end, roll dough up . Repeat with remaining dough and filling. Wrap rolls in wax paper or plastic wrap and chill in fridge several hours. This dough/roll is pretty soft. I sometimes put the rolls in the freezer for an hour or two before baking to make them easier to slice. To make the cookies: Preheat oven to 375 degrees. Slice the rolls into ¼ -inch slices and place an inch apart on a lightly greased baking sheet. Bake about 12 minutes- or until cookies are a light golden color. Cool on wire rack. Makes about 5 dozen. 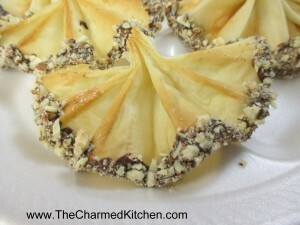 If you want a cookie that is really going to impress you might want to make these Chocolate Fans. They are crisp, not too sweet and tipped with chocolate and fine chopped nuts. While they look difficult to make, they are actually quite easy. For starters you don’t have to make dough. These are made with phyllo dough. Phyllo is found in the freezer section at the grocery store. Phyllo dough (also spelled filo) can be a little fussy. Be sure to keep extra dough covered with a damp towel so it won’t dry out and get brittle. It is best to work quickly when making these. We made these dipped in finely chopped toasted almonds. Other nuts could be used. You could also use white chocolate, if you prefer. I have even added a few sprinkles to the nuts for a pop of color. Remove phyllo from box, still rolled up and cut crosswise into 5-6 equal pieces. Keep unused dough covered in a damp towel to prevent drying out. Take one piece of dough and open it up, cutting it in half crosswise. Take 1 sheet and brush with butter. Place another sheet on top and brush again with butter. Place third piece of dough on top and butter again. Starting at short end begin to fold the dough in ¾ inch folds, accordion style. Pinch together at one end and fan out the dough at the other. It should look like a little fan. Place on ungreased baking sheet and repeat with remaining dough. Bake at 375 degrees for 5 minutes. Cool. Melt chocolate and shortening together in microwave or on top of double boiler. Stir to smooth. Dip tip of wide end of fans in melted chocolate and then in the nuts or coconut. Place on a rack to cool and harden. Makes about 65 fans. Can be frozen. *I buy frozen phyllo dough but be sure to get the right one. Around here there are 2 different sizes. You’ll need the long box- where the dough is 15 inches long. The funny name for these cookies is really easy to explain. The cookies are flavored with both lemon juice and lemon zest in the dough. When nearly cooled, they are rolled in powdered sugar. They end up looking like little snowballs. Yummy, lemon flavored snowballs. The dough also contains finely ground almonds, for extra texture. They are a delicate, cake like cookie, with a slightly crisp outside. You could also add a little grated lemon peel to the powdered sugar, before rolling the cookies in it, for a more intense lemon flavor. In a mixing bowl, cream butter, sugar and egg until well blended. Add lemon juice and peel. Combine flour, baking soda, cream of tartar and salt; stir into creamed mixture. Add almonds. Cover and refrigerate the dough for at least 1 hour or overnight. Roll into 1-in. balls. Place on ungreased baking sheets. Bake at 350 degrees for 10-12 minutes or until bottoms are lightly browned (cookies will not brown on top). Remove immediately to wire racks; cool for 5 minutes, then roll in confectioners’ sugar. Makes 36. My family always gets together the night before Thanksgiving for a pre-Thanksgiving meal. Since we live in different cities, it is the first night we get to catch up before the big day. We try to keep it simple. My niece makes my Busha’s Polish Mushroom Soup and I make an assortment of filled breads. I have made these breads with plenty of different fillings, and I have posted many of those recipes. This year I made the Reuben, which was requested by my nephew. I also made one filled with spinach, mozzarella and feta cheese, which I knew my niece would like. 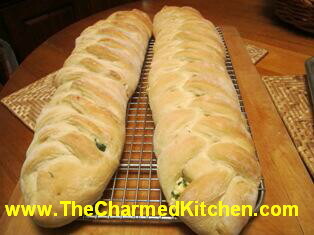 Several people have requested the recipe for this spinach bread, so here it is. Grease a large jelly roll pan and set aside. Place a shallow roasting pan on the stove and fill halfway with water. Start heating the water up. You’ll need it later. Prepare filling: Take spinach and place in a medium bowl. Combine it with cheeses and remaining filling ingredients. Use your hands and squeeze the ingredients together, partly to mix them up well, but also to get them to stick together a little. Set aside and prepare the dough. Set aside 1 cup of the flour. Combine remaining flour with the other dry ingredients in a medium bowl. Stir in water and oil and gradually stir in enough flour to make a soft dough. Turn onto lightly floured surface and knead until dough is smooth and elastic, about 5 minutes. Roll dough into a rectangle about 16 x 8 inches in size. Spread spinach mixture down center of dough. Squeeze it a little, sort of in a tube shape. You need to fold the dough over this mixture, so pressing it together helps with the next step. Cut one-inch wide strips of dough from filling to edge on both sides. It will sort of look like fringe. Alternating sides, fold strips up and over the filling at an angle. Pinch the ends. Carefully lift loaf onto greased jelly roll pan and place at an angle, so it will fit. Cover with a towel, and place the jelly roll pan on top of a roasting pan, half-filled with simmering water for 15 minutes. Because quick-rising yeast is more heat tolerant, the simmering water helps the dough to rise faster. After 15 minutes, remove towel and place jelly roll pan in oven. Bake in a preheated 375-degree for 20-25 minutes, or until golden brown. Cool slightly before slicing. Serve warm and refrigerate leftovers. Bread can be baked ahead of time and reheated, too. Wrap in foil and place in a preheated 350 degree oven for about 25 minutes. Loosen the foil after 10 minutes so the bread does not get soggy. Note: The variations for this bread are almost endless. Some favorite combinations are ham and Swiss with mustard, roast beef and cheddar, chicken, broccoli and cheese,, pizza, assorted fillings. You get the idea. Use your imagination and have fun. Just be careful not to overfill, or the bread will be hard to move, use fillings that aren’t too runny and always use cold fillings. 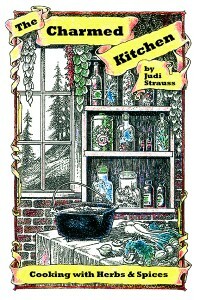 If you want to use regular yeast, in place of quick rising yeast, use warm, rather than hot water. Also, don’t let dough rise over boiling water. After kneading cover dough and let rise 45 minutes. Punch down and assemble as in original recipe. Cover with a towel and let rise until dough looks puffy, about 40 minutes. Bake as directed above. These breads can also be frozen. 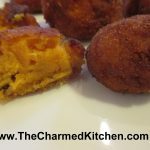 If you are looking for a new way to serve sweet potatoes, you might just want to try this recipe. Sweet potatoes are mashed, mixed with butter, eggs and spices, rolled in bread crumbs and fried. 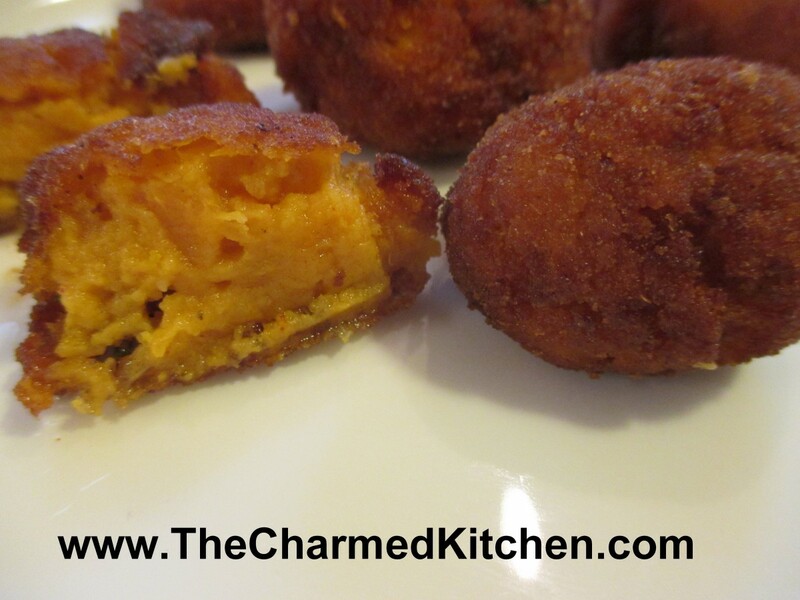 The end result is a delicate morsel that has a crunch on the outside- and creamy mashed sweet potatoes on the inside. They are addictive!!! They make a great side dish, or can be served as an appetizer. While they are good hot, they maintain their crunch even after cooling down. I first had a version of this recipe many years a go when a coworker made them and brought them to work. I found her original recipe and added more seasonings to it. I love them as much now as I did then. The mixture, even after chilling, is soft. I placed spoonfuls of the mix in the breadcrumbs and rolled them gently into balls. The puffs are soft, even after frying, so remove carefully from the oil. You can fry up a batch in a few minutes, and serve right away. You can also cook them ahead of time, then reheat them before serving. Combine sweet potatoes with butter and egg, stirring to mix well. Add seasonings and stir well. Chill mixture at least a couple of hours. Heat oil to 350 degrees. You should have at least a couple of inches of oil in the pan. Shape sweet potato mixture into 1-inch balls. Roll in crumbs and fry until golden brown. Drain on paper towels and serve. You can make a head of time, then just warm in the oven when ready to serve. They can also be fried and frozen for later use. These make a nice side dish or even can be served as an appetizer. They are very soft, even after frying, so remove from hot oil carefully. I have posted this recipe before, but I think it is worth posting again. If the only way you enjoy sweet potatoes is as a side at the holidays, or in pie, it is time to expand your thinking about them. In this recipe, the mashed sweet potatoes add both sweetness and moistness to the finished cake. Great plain, or with a dollop of whipped cream and some fresh berries. 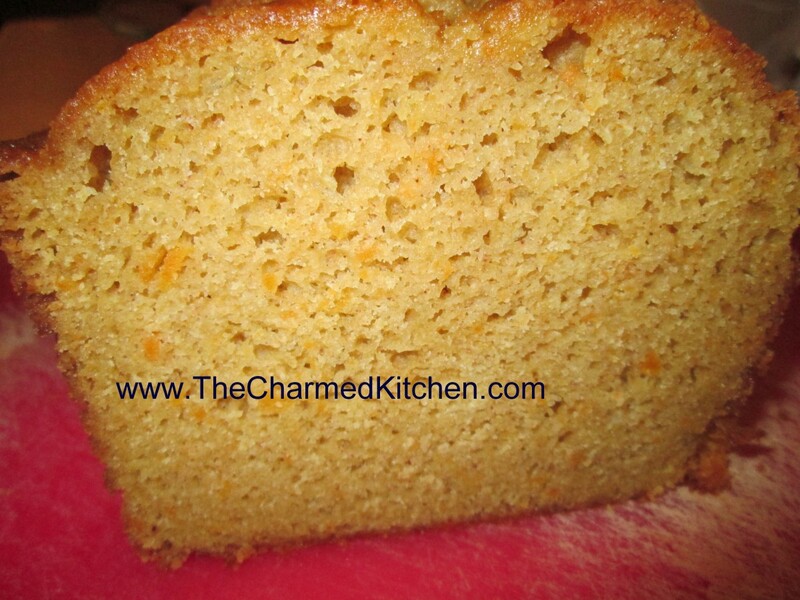 This cake makes a great dessert or a nice addition to a brunch menu. Also a nice way to use up leftover mashed sweet potatoes, if you find yourself with leftovers. Preheat oven to 300 degrees. Lightly oil an 8×4-inch loaf pan. Mix flour with next 4 ingredients and set aside. In large mixing bowl beat together butter and sour cream. Beat in sugar and then beat in eggs 1 at a time, beating well after each addition. Stir in mashed sweet potato and vanilla. Stir in dry ingredients and pour batter into prepared pan. Bake until tester comes out clean, about 1 hour and 15 minutes. Cool in pan 30 minutes before loosening cake sides from pan and removing. After cake has cooled wrap in foil and store at room temperature. Serves 8. * If you don’t have cake flour you can make your own. Simply measure out a cup of all purpose flour and remove 2 tablespoons of the flour. That is now the same as a cup of cake flour OR remove the 2 tablespoons of flour and replace them with 2 tablespoons of cornstarch and sift together to combine. I do the flour/cornstarch mix and keep a batch on hand for when I need it in baking.